Summer days by the sea are back. When afternoons on the coast turn into too much fun in the sun, these products will be your burnt skin’s much-needed remedy. Greek yogurt is best known as a healthy snack, but for centuries it’s been used in beauty remedies in Greece for its smoothing and strengthening properties. Korres is taking a page out of the past by infusing this cream with real Greek yogurt. The long-lasting gel is perfect for relieving dry, stinging, sunburnt skin. For maximum effect, keep refrigerated. $26 for 5oz. The secret to this soother’s success is linden flower extract, an ingredient frequently used to help skin rejuvenate. Filled with powerful antioxidants, the extract works wonders cooling and calming burns, while coconut oil, bee pollen and glycerin hydrate parched skin, leaving you buzzing with healthy feeling skin. $10 for 6oz. 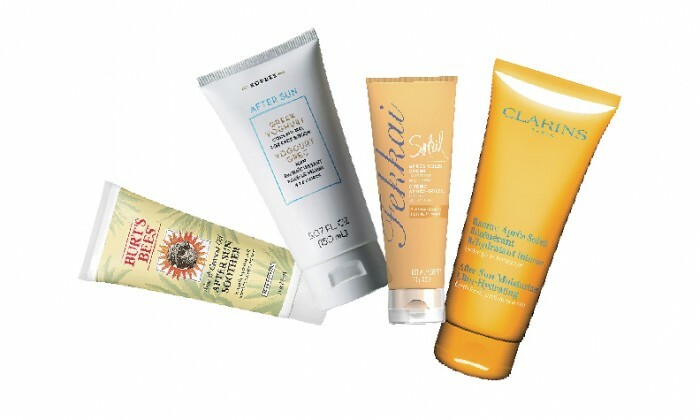 The ideal result of a dreaded sunburn is for it to eventually fade into a healthy tan. This ultra-moisturizing cream is designed to foster a radiant, long-lasting bronze. Watermelon, sunflower and mimosa tenuifora extracts soothe skin and prevent peeling. A hint of cardamom extract highlights that natural glow. $37 for 7oz. A day in the sun can grace hair with rich highlights but the tradeoff is some seriously parched strands. Fekkai created the solution with its after-sun conditioning crème, designed to hydrate, smooth and restore shine to the most wayward of tresses. Infused with sunflower seed oil, the cream softens the hair without weighing it down, leaving beautiful, sun-kissed locks without the frizzy damage. $20 for 4oz.